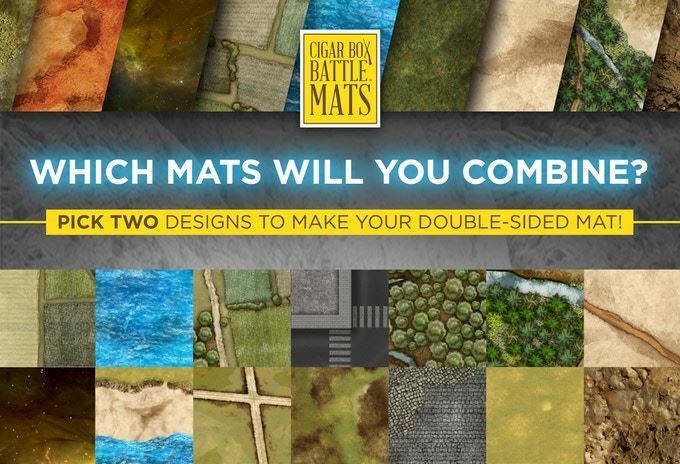 As we recently discussed in our interview with Chris Ward and Cory Ring in episode 221 of the podcast, Cigar Box Battle have launched a Kickstarter project to produce a limited edition version of their plush battle mat that is double-sided. On the show Chris and Cory talked about launching this on the 1st August, but it appears to have actually been launched a couple of days early. The project is running until 1st September 2017, and has already raised over 10 times its funding target with a month to go. A single double-sided mat will cost $99, with US shipping at $15, although international shipping is likely to be much more expensive. Remember, these mats are only available during this Kickstarter project. The cost of shipping their normal mats to the UK is $39, so we can expect the heavier mats to cost that or more. .
And if the package is picked up coming through customs you’ll have to add have to add VAT at 20% and the £13 plus handling fee (that’s for the Post Office, if they use a courier company the handling fee would be higher). Not cheap at all, but they do look like an excellent product. They are indeed excellent, but the whole postage/customs issue does make ordering them direct from the US to the UK problematic, to say the least – hence why it is usually much better for us Brits to order via North Star. Obviously, this isn’t possible in this particular case, but the outcome is that one mat would cost almost double the pledge price, once you take everything into account. $114 in the US is a good price. Around $180 to the UK, not so much.